Just when I thought, after making whoopie pies, a bundt cake, blondies and pancakes, that I might be over gingerbread and ready to move on and explore other flavors this holiday season, I came across another recipe that I just had to have in my life. I was in bed flipping through cookbooks (you read cookbooks in bed too, right?) when I saw this gingerbread ice cream. It’d been months(!!) since I’d made homemade ice cream so I was definitely craving it, and as I scanned the ingredient list, I realized this had the potential to be ridiculously good. If it hadn’t been nearly midnight and if my flannel sheets hadn’t been oh so cozy, I just might have been crazy enough to go downstairs and throw the custard together that night. For a variety of reasons, I didn’t actually wind up making this ice cream until a few days later, but it was 100% worth the wait. I enjoyed this so much I’m half tempted to make several batches before Christmas and gift it to family and friends, though it’s probably a better idea in theory than reality. “Here, open your present – quickly, before it melts.” The gingerbread flavor in the ice cream is complex, thanks to the combination of ingredients the recipe calls for. 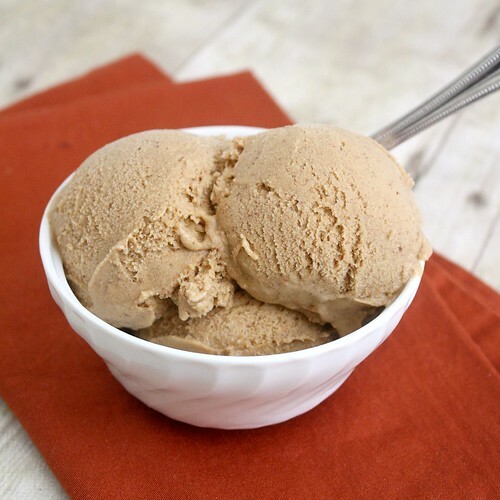 The milk and cream are infused with fresh ginger to create the base, then molasses and brown sugar are added, and finally lots of warm spices, to ensure every bite of this ice cream screams holiday. Texturally, it was great too – firm, but not so firm I couldn’t scoop it straight from the freezer, and not at all icy (even though I’d used 1% milk in place of whole). I know we’re all about cookies this time of year, but if you want to branch out and try something different, I suggest starting here. No matter how cold it might be outside, it’s never too cold for homemade ice cream! In a medium saucepan, combine the heavy cream, milk and fresh ginger. Bring to a boil over medium-high heat. Remove the pan from the heat and set aside to infuse for 30 minutes to an hour, then strain the mixture, discarding the ginger. Return the mixture to the saucepan and heat just until it comes to a simmer. Meanwhile, whisk the egg yolks, brown sugar, molasses, ginger, cinnamon, cloves, nutmeg and salt in a heatproof bowl. Slowly add the warm milk/cream mixture to the egg yolks, whisking constantly. Pour back into the saucepan and set over medium-low heat. Stir constantly until the mixture thickens enough to coat the back of a wooden spoon (about 170-175 F on an instant read thermometer). Strain the custard into a heatproof bowl and stir in the vanilla. Cover and refrigerate until thoroughly chilled (overnight is good). Freeze in your ice cream maker according to the manufacturer’s instructions. Transfer to airtight container and freeze until firm, at least 1 hour. 37 Responses to "Gingerbread Ice Cream"
Whoa. This is my heaven! I bought this cookbook too and bookmarked almost every single recipe! I was planning on making this one sometime soon and glad to see it got rave reviews. Seems like we are on the same wavelength! Looks so fabulous! Ahhhhh! I want this and LOVE this idea! This looks so tasty! Love it! I have a gingerbread ice cream recipe saved, but this one looks better, so I’m swapping them out. 🙂 Yum! I totally read cookbooks in bed too! This sounds great. I’m always tempted to try and healthify my ice cream recipes by subbing some lower fat milk but always wimp out and go all out! Ah! Just when I thought I couldn’t want Gingerbread things more, this ice cream appears! This looks divine! I need an ice cream maker now! I think you should definitely give this out as gifts! Who would be upset to get ice cream?! Even though its cold out I will have to try making this ice cream! I can never have enough pumpkin desserts and the same goes for gingerbread. How cute would this be sandwiched between two gingerbread men? And I love how there is fresh grated ginger in this recipe to really bring out that spicy flavor. Wow – now that is some serious ice cream! What a different and fun way to have gingerbread! This must taste heavenly! Yum! This would be really good with some Christmas cookies on the side! Any suggestions for a particular ice cream maker to buy? @Mary Beth – I have one from Cuisinart (I think it’s the ICE-20) and really like it. Many of my friends have the Kitchen-Aid attachment and have goods things to say about that too. Mmm, that does sound really good! Sick in bed right now with cookbooks piled around me. But, I must confess, that even when I am not sick I have cookbooks in the bed with me. My poor husband has to push the cookbooks out of his way when he comes to bed at night. I’m hopeless, but happy. Thanks for posting this great looking recipe. I am excited to give it a try. There is no sin in ice cream in December–just curl up under a warm blankie, watch a favorite movie, and eat ice cream. ta da! I just bought an ice cream maker and have only used it once so far. This is definitely happening soon. I bet this would be amazing with a slice of warm apple pie! I loved the flavor of this ice cream but a little bit went a long way. It was very rich…but delicious! This dessert was like Christmas in July! The spices were so warm and Christmas-y, but the creaminess of the ice cream was like a decadent summer treat. Thanks for sharing! I read cookbooks in bed too. 🙂 Who doesn’t? LOL. This sounds awesome. I’ve been thinking about making ice cream lately…it’s a toss up between peppermint and this. Or, why choose? Both sounds like a good solution. I tend to read cooking magazines in bed; the cookbooks are too big and heavy sometimes. =) I really want to make some ice cream–it’s definitely been too long. I need to start with the recent TWD ice cream, but this is going to be high on the list after that. This is perfection! 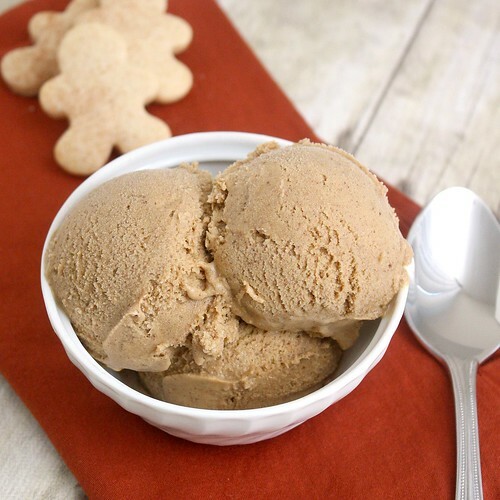 Last time I had gingerbread ice-cream was n Paris… I’d love to =recreate that experience! The ice cream looks ace! I bought this cookbook a month or so ago too and I am so excited to finally getting round to making some stuff from it. It’s funny, but every time I find an ice cream recipe on another blog, it seems to lead back to you. Another one i HAVE to try. Excellent sharing Thanks for share i am sure its must help me. thanks for doing this. I loved the flavor of this ice cream. It is an Amazing flavor. So I made this, and it was very unpopular. The molasses flavour was hideously overpowering. Surely our molasses here in New Zealand must be different to the states or something?! It was so so strong. No one hand more than a taste. I only used 1/4 cup as instructed. Any thoughts?